WEST SYSTEM® Six10 is a two-part, pre-thickened epoxy adhesive formulated with properties that make it perfect for many adhesive applications. 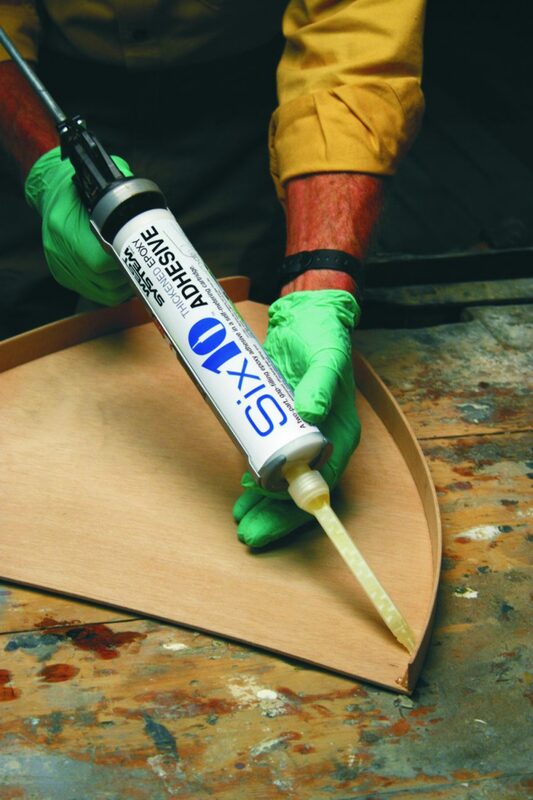 Compared to other ready-to-dispense adhesives, its particular physical properties make it ideal for stitch and glue boat construction, fiberglass laminate repair and general bonding. This new formulation has a good balance between the elongation and toughness of G/flex® and the strength and stiffness of our 105 Resin-based epoxies. You can use it with as many materials as possible including wood, metals and composites. The long working time with fast thru-cure and unique shear thinning are additional characteristics formulated into Six10 that contribute to its ease of use. With the 600 Static Mixer attached to the Six10 cartridge, it’s easy to lay down a bead of thickened epoxy adhesive right where you need it. Experienced WEST SYSTEM users are familiar with the handling characteristics of 105 Resin-based epoxy thickened with 406 Colloidal Silica Filler that allows it to be non-sagging, yet trowel easily. Six10 Adhesive provides the same handing properties right out of the cartridge but achieves it with shear thinning, a property that allows the viscosity of the adhesive to become lower when a shear force is applied. A shear force is applied when the epoxy is mixed or spread out over a surface, which causes the viscosity of the Six10 to become lower resulting in a “thinner” consistency. When you are done applying or mixing Six10 and it is no longer being worked, or “sheared,” it will start to increase in viscosity and develop a thicker consistency. This shear thinning property enables Six10 to be easily dispensed out of the coaxial cartridge and through the static mixer and then tooled smoothly into a fillet that won’t sag during the cure cycle. The shear thinning property also enables Six10 to be used for wetting out light to moderate weight reinforcing fabrics such as fiberglass and carbon fiber. This feature makes the product convenient for performing small fiberglass boat repairs. If you use a stiff plastic spreader, Six10 can wet out any fiberglass fabric lighter than 12 oz per square yard as a result of its shear thinning characteristics. Six10 is readily tooled into a fillet. The consistency of Six10 Thickened Epoxy Adhesive is perfect for fillets. Six10’s cure profile also has some handy features. Our chemists developed the hardener to provide a long open time but fast thru-cure. With a pot life of 42 minutes, WEST SYSTEM Six10 will provide over an hour of working time in a thin film but will achieve an initial cure in just 5–6 hours. An additional characteristic of Six10’s cure profile is that sufficient working time is maintained in warm temperatures. The long open time also means that the epoxy will stay workable in the static mixer for 42 minutes, which is very practical for long or complicated assemblies. All adhesives rely on good surface “wet out” and saturation to achieve a good bond to the substrate. Six10 has a viscosity high enough to resist sagging but can still saturate and wet-out a surface without pre-coating, thanks in part to shear thinning. Our chemists accomplished this formulation by using an ingenious filler package in both the resin and hardener components. With the 600 Static Mixer attached to the Six10 cartridge, it’s easy to lay down a bead of thickened epoxy adhesive right where you need it. 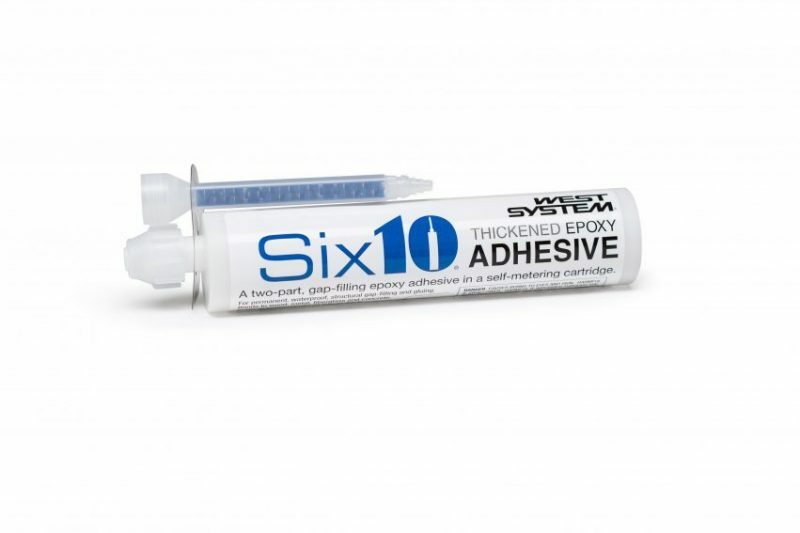 The consistency and of Six10 Adhesive is perfect for fillets. Our chemists accomplished this formulation by using an ingenious filler package in both the resin and hardener components. The physical properties of WEST SYSTEM Six10 were developed to ensure good adhesion in many applications. The charts above illustrate the properties of our G/flex and 105 Resin-based epoxies compared to WEST SYSTEM Six10 and illustrates how Six10 fits in nicely between the high strength of 105 Resin-based combinations and the toughness of G/flex. 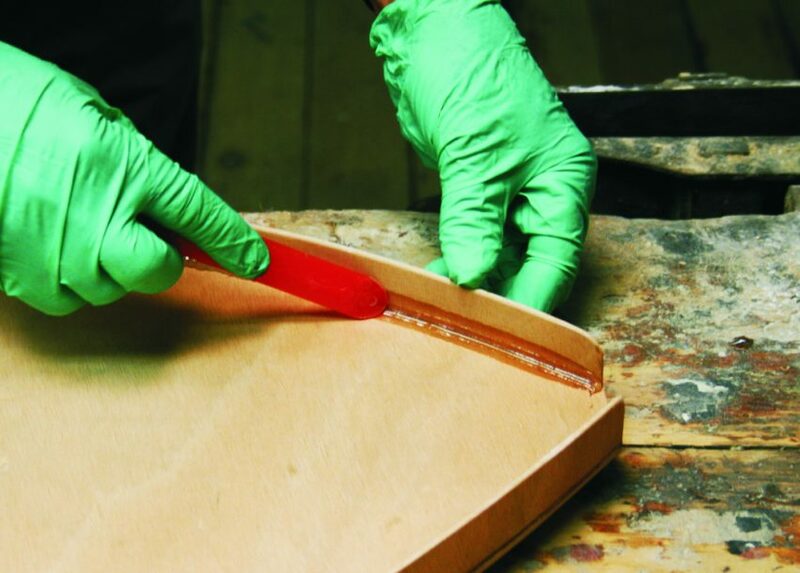 As we discussed in Epoxyworks 25, G/flex was formulated to be flexible enough to work in many unique situations but 105 Resin-based epoxies are still recommended for applications where a stiff laminate is required. WEST SYSTEM Six10 has a modulus slightly lower than a 105 Resin epoxy, making it appropriate for many applications where a filled a 105 Resin-based epoxy would be used. When G/flex is used to laminate lightweight fiberglass cloth, the result is a flexible laminate. Six10 will create a fiberglass laminate much closer to 105 Resin epoxy laminate properties. Six10 will wet out fabrics up to 12 oz per sq yd. For heavier fabrics, a 105 Resin-based epoxy with its low viscosity should be used to ensure thorough fabric wet out. Six10 can be used for many of the same jobs where a thickened 105 Resin-based epoxy is appropriate, it is a useful adhesive that adds convenience to the versatile WEST SYSTEM product line. It is completely compatible with all other WEST SYSTEM products so that it can be used on top of or underneath any 105 Resin-based epoxies, whether cured or uncured. We carefully formulated it for use in many applications where strength and adhesion are important. The cartridge works by utilizing the movement of the piston to simultaneously dispense the resin and hardener from separate chambers. The molded chambers and passageways accurately control the ratio and prevent the resin and hardener from contacting each other until they are outside the cartridge. Our technical advisors and chemists extensively tested the performance of the cartridge and 600 Static Mixer to ensure accurate metering and thorough mixing of the Six10 resin and hardener. The reliability of WEST SYSTEM Six10 in the self-metering cartridge meets the high standards our customers expect from a WEST SYSTEM product. If you have questions about Six10 our Technical Advisors are on hand to answer. Just call 866-937-8797 toll-free.